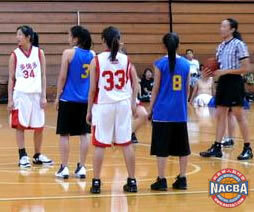 This year, 4 spirited teams took to the courts, playing for the NACBAIT Championship in the Liberty Division. 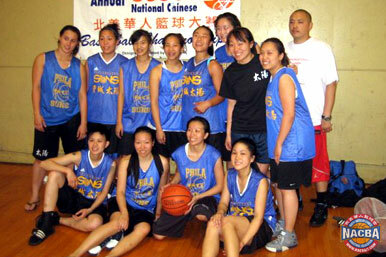 When it all boiled down to the National Title match, it was the undefeated and top seeded Toronto CCYAA B v/s the Philly Lady Suns (2005 runners-up). In pool play, Toronto was undermanned but still managed to take a 27-25 victory over Philly as half of the TO team had been delayed on an international flight. This time around, everyone expected Toronto to roll to the title since they would now be at full strength. Toronto started off in a stupendous man to man defense that is unseen at the Liberty level. Philly responded to the suffocating defense by throwing the ball away at every opportunity. 5 minutes in, and the score was 10-0, CCYAA. Toronto was playing as well as they could possibly play, as Lydia Kwan and Jocelin On were a fabulous duo. Philly was forced to call a timeout, and regroup. The Suns returned to the game with a better sense of urgency. They quit their man defense and went to a zone on defense, and started to drive and dish to open shooters on offense. After a couple of Toronto turnovers, and easy scores for Philly, they were right back in the game. Shannon “Munchkin” Yu (4 points, 3 assists, 2 steals) and Rebecca Chin (2 points, 4 dimes, 3 rebs) were great on isolation clearouts as they either scored on layups or kicked it to waiting teammates in the corners for easy looks. In the second half, it was all Suns as Philly’s game plan was to not give up an easy looks, and Toronto’s free throw shooting was only 8 for 16. Center Tracy Ng (6 pts, 6 rebounds) scored a couple of really tough buckets as she feasted inside, and MVP Ling Lai (11 pts, 3 triples, 4 turnovers) was sick from threeball land. Philly went up by as much as 11, before cementing their place in the record books 28-20. Jocelin On (5 pts, 2 rebs, 4 steals, 5-9 FT) and Miriam Tsao (3 points, 4 rebounds, 1 block, All-Tournament) were the top players from CCYAA B. Go Suns!